Pat is a native of Atlanta, Georgia, and earned his bachelors degree from North Carolina with majors in Mathematics and Physical Education. He then earned a Master of Arts in Teaching with certifications in the same subject areas, while teaching and coaching intercollegiate athletics at Carolina. Pat came to Oregon in 1980 to study cardiovascular, exercise, and environmental physiology with Dr. Eugene Evonuk, former Director of the Laboratory of Applied Physiology. Professor Evonuk discovered the thermal dilution technique for measuring cardiac output, was an avid outdoor enthusiast and environmental physiologist, and was a powerful influence in Pat’s life. Pat earned his PhD in 1984 with a major in physiology under Dr. Evonuk and minor in human anatomy under Dr. Edna Wooten. Pat has taught a variety of courses including medical physiology, human physiology, cardiovascular physiology, exercise physiology, nutrition, and anatomy. 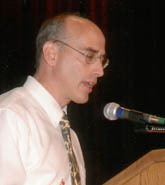 In 1999, he received the Thomas F. Herman Faculty Achievement Award for distinguished teaching. Pat’s research has examined lactate dehydrogenase and cardiac isoenzyme profiles, hypertension and 24-hr ambulatory blood pressure monitoring, and sports epidemiology. He is currently working with Don Pate in Neuroscience to develop an ambulatory blood pressure monitor which assesses posture and automatically adjusts sensor sensitivity based on alterations in Korotkoff (blood pressure) sound intensity. Pat is a member of the American Society of Hypertension (ASH), the American Heart Association (AHA) , and the American College of Sports Medicine (ACSM). With AHA, Pat is on the High Blood Pressure Research, and Nutrition, Physical Activity and Metabolism Scientific Councils.